It’s dusk. Red-hot orange smears across the sky, setting fire to the clouds and sea. The sun lingers on the horizon as if it isn’t ready to leave us. I have only just flown in but I know this place is going to hypnotise me. I skull the last of my Budweiser, happily glowing in its wake. We are tucked away in a nook on Kauai, an island to the west in the Hawaiian archipelago. 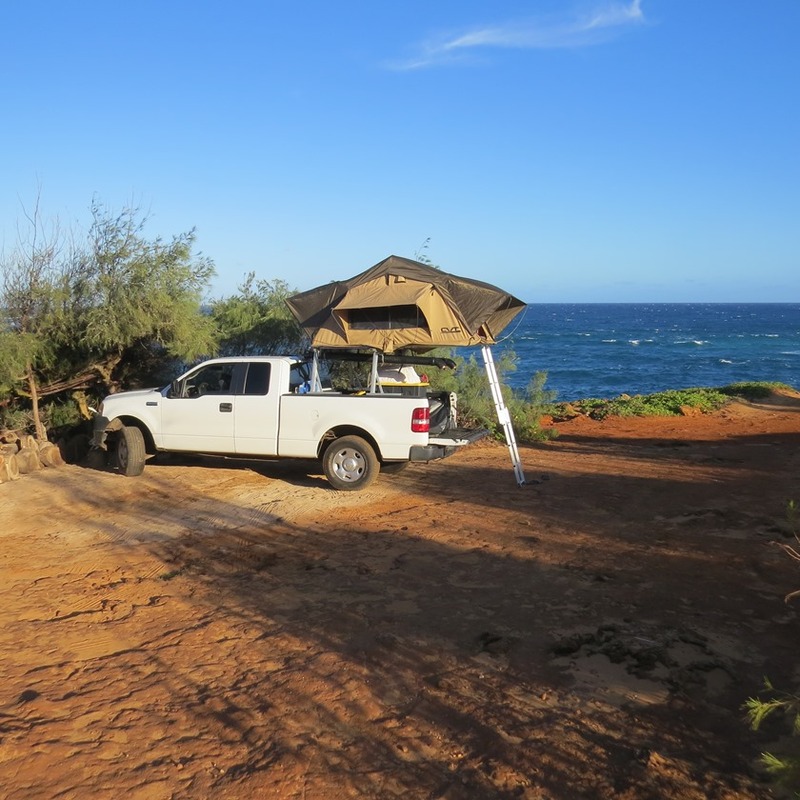 We are here to explore the Garden Isle in a rooftop camper — the first of its kind in Kauai — our itinerary set by the sun and swell. Darkness falls and the wind blows in from the east, creating mini tornados on the ocean surface. Our temporary home bears the brunt of the wind storm which gets stronger and stronger by the hour and we feel as if we are about to lift off and be carried away. Jetlagged, we decide to pack up the tent in the ink-black night. No street lights, no people, no voices, just wind violently blowing saltwater and dust onto our home. I always believe every great place challenges you – it is almost like a good travelling omen when the start of the trip starts with hiccups – so even with blood shot eyes and no real sense of direction, we pack up camp and drive the desolate roads north, attempting our first real taste of driving on the right side of the road. We have no destination in mind and the only real light is glowing down from the super moon. I smile, this is adventure, this is travelling. We find shelter in a bay on the edge of a jungle. Little did we know, that this wind storm was the powerful generator of the swell to come the next day. I wake up in a jungle with the sound of waves echoing through the trees and I realise where I actually am. Flash backs of Jurassic Park overtake me and it is easy to see why the 1992 classic was filmed here. Towering cliffs of the north look as if they are still hiding dinosaurs, a screech from a Pterodactyl could be heard at any moment. 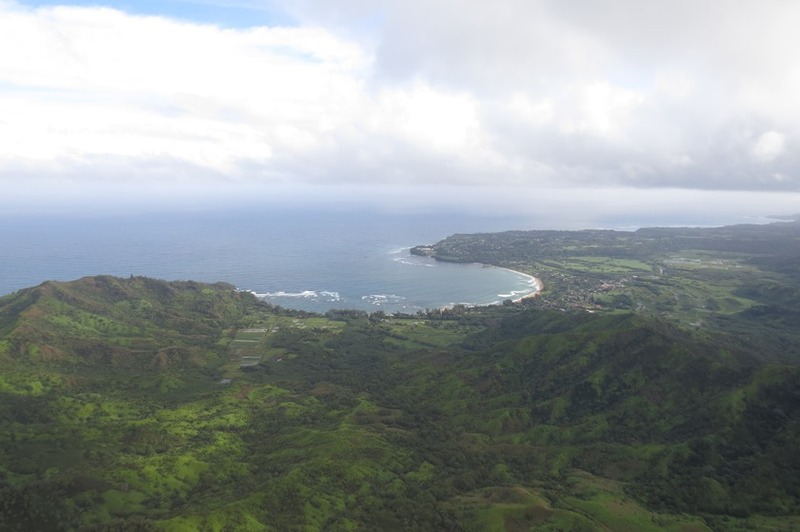 We pull up to Hanalei, a sleepy bohemian township huddled in a moon-shape cove. The waves on the outer reef are double overhead right handers with only a handful of people out. Closer to the shore is a shoulder high A-frame with no one else out, so we opt for the lonely waves. A turtle comes to say hey, the first of many in this marine paradise. The words of a stoned local we met in the night filter through my mind, “no matter where you are, there is always a Tiger Shark 20 metres from you”. I smirk at the thought as the lazy turtle bobs next to me, relaxed and comfortable in the line-up, surely there are no tigers around. After this fun session we search for a camping spot but first we need supplies. Poke bowls aka fresh yellow-fin tuna dishes are everywhere in Kauai’s stalls and we have to try one, along with the local beer, Fire Rock Pale Ale. At a little tiki bar in the township we sit and listen to two weathered men with greying hair play slack guitar. I awaken at first light, feeling the aftermath of the Fire Rock. Luckily, the jungle and pounding Pacific Ocean know how to instantly freshen your soul. The clouds open up and the rain filters down, in large thick droplets. Jungle rain. We search for waves down a forest path and find a windblown left hander crumbling off a rocky point. Nothing impressive. We decide to check it from another angle. A web of tree vines wind down a steep volcanic rock face to the sand, the only way to access the beach. We watch the waves for 20 minutes and completely out of boredom, paddle out. As soon as we get out the back, the windy, crumbling wave turns offshore. Three-to-four foot sets wrap around the rocky reef, peeling off to a wally, made for open face carve waves. The point break we had been watching was now a completely different spot. That is the beauty, the secret about Jurassic Park, one minute you can be sitting silently with nothing to do and the next you’re running from a T’Rex aka paddling into a lonely line up with your only other surf buddy being a giant green sea turtle. It is hard to forget the last surf. The moody weather. The snap change in wave height, length, body. Kauai is a moody island. It becomes even more evident when we decide to go west. 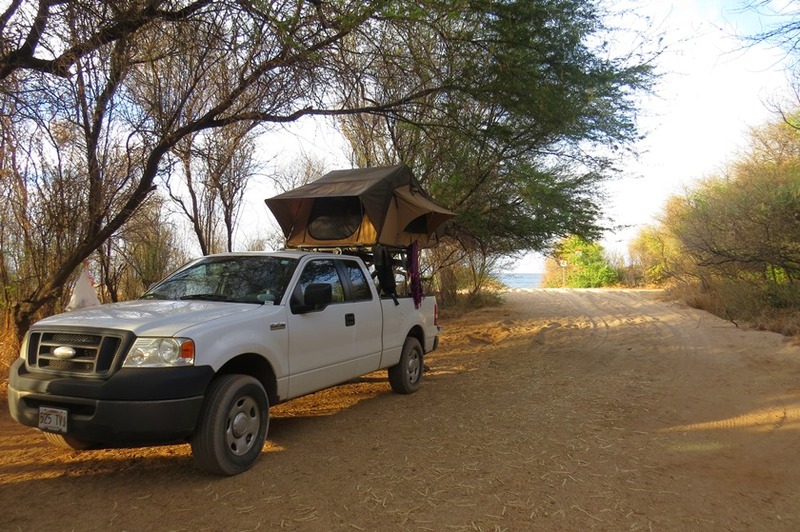 We hear whispers of a wave in the west which is only accessed down a long, dirt road next to dramatic cliffs. Naturally we go. The southern coast transitions us from thick lush forest to red earth, the Wild West. 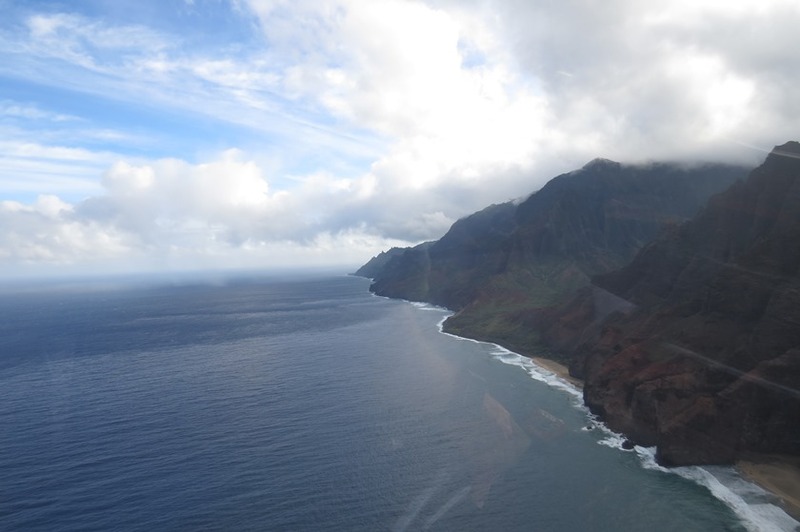 Home to Waimea Canyon, this area of Kauai is dry and cracked. Iron-stained earth sits where old sugar cane fields once dominated. I feel as if tumble weed is about to roll down the road. In front of us is the tallest most majestically chiselled cliffs I have ever seen. Their existence instantly haunts me; iron-stained terrain with dots of emerald vegetation, the beauty never leaves you. We have reached the end of the highway and all that is left is a long, gravel road. A 13-mile-long stretch of bone-white sand dunes greet us on the other side. This is paradise. Time does not exist here. The water is crystallite. The sand piping hot from glowing sun beams. The waves are fun, easy, uncrowded, three-foot, peeling. The nights are long, balmy, and star-filled. I dive into solitude; shower naked at dawn watching surf roll in, I cheers my beers to the sunset, I watch it change from crimson to violet to blood orange as if I am swiping through Instagram filters. I sizzle marshmellows over a bonfire and wake up to an alarm of chickens hanging out on the beach. Our first human contact is when our truck gets stuck in soft golden sand and two local surfers pull us out. Beer is our currency and we pay them generously. Kauai surf trip will give you what you deserve. She will not reward a tourist, she will give it all to the travellers, the adventurers. This is the place you go to fall off the grid. 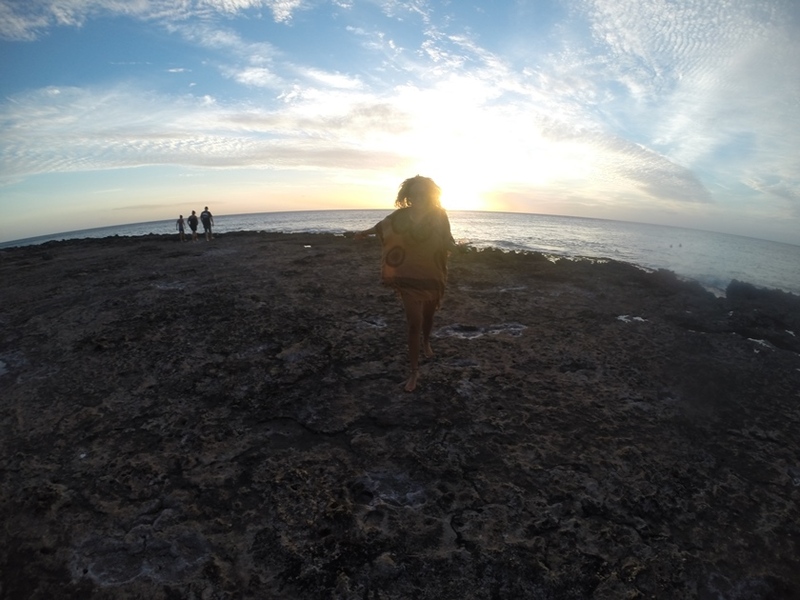 It isn’t just a surf trip, it is exploring in its rawest form. Your reward? A lonely line up with fun waves. Kauai is adventure, it is Jurassic Park. Reality can taste sour after a surf adventure, however, we ease ourselves back into it with a stopover in Oahu. Needing no introduction whatsoever, this island of Hawaii is notorious, for more reason than one. The North Shore will blow your mind. Pipeline is god. Seeing it, surfing it, whatever you do there, it will ignite your soul. Watching a 6-foot set change to 15-foot is invigorating. Drive Sunset Beach and pull over anywhere, you will get waves. Mentawai Surf Season Review – How was 2016 in the Surfing Mecca?